Google just brought artists' renderings of its self-driving car to life. Google calls this the "first real build" of its self-driving car. Image source: Google. Steering wheels? Unnecessary. Car accidents? History. That is, if the folks at Google (NASDAQ:GOOG)(NASDAQ:GOOGL) have anything to do with it. Lucky for us, they do. In fact, to borrow its own words, Google has been working for several years toward the goal of "vehicles that can shoulder the entire burden of driving." Earlier this week, the search giant took arguably its biggest leap yet toward bringing that technology out of the lab and into the fray, unveiling what it calls the "first real build" of its self-driving car. While the complete, polished version might look roadworthy, Google insists it's still a prototype that safety drivers will oversee "for a while longer, using temporary manual controls as needed while we continue to test and learn." For now, those tests will occur on Google's own canned track. But the team intends to take to the streets of California -- one of several states in which self-driving cars are already legally allowed -- in 2015. 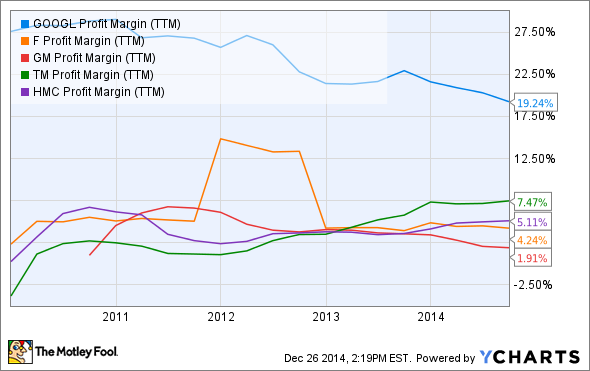 GOOGL Profit Margin (TTM) data by YCharts. As a result, it seems safe to think of this as a reference design of sorts to help auto manufacturers fully understand Google's vision for the platform. Consequently, just as it does now with Android for electronics OEMs, don't be surprised if Google doles out the designs and software for its self-driving cars to auto manufacturers at little or no cost, with the primary aim accelerating the rollout of antonymous vehicles to the general public. By doing so, Google would be giving consumers something even more valuable to users and the company: Time. More specifically, additional time to spend on their various Internet-connected devices. The ancillary data collected by these self-driving vehicles, in turn, could drive higher profits and improvements to the search juggernauts digital services, advertising abilities, and dozens of Google apps. And that time isn't trivial: According to Harvard Health Watch Publications, the average American spends 101 minutes per day driving. If even a fraction of that time is spent online, there's a good chance Google will reap the rewards. But that also doesn't mean paid licensing is completely off the table. "We are still assessing the business model," Urmson insisted earlier this month. "We don't know what the right relationship is." Of course, it will be years before we see self-driving vehicles adopted on a wide scale. But one thing is sure, it's in Google's best interest for that time to be sooner rather than later.